In February there is a fine display of snowdrops in the orchard and the hellebores show the garden is waking from the winter. In March (depending on the temperature) the native English daffodils all over the garden start to come out and some last until late April. At the bottom of the garden there is an ever increasing display of primroses as well as daffodils which peaks in early April. Hellebores also dominate at this time and the muscari (grape hyacinths) give Erythroniums, if not eaten by the muntjac, are lovely and the scent of the azaleas fills the air. A big magnolia soulangeana looks spectacular at this time but tulips can only be grown in pots owing to the far too numerous muntjac. A feeling that summer has begun is when pots of various succulents from the glasshouse come out and the copper beeches with their new leaves bring a pinkish glow. The low beds below the house and the gravelled area around the house are at their best at this time. A mass of Bowles Mauve Wallflower flower for a large part of the year and the Echium Pinana plants which have self seeded soar 12 feet into the air smothered by bees. The meadow is now flowering prolifically especially with the camellesi and the orchids which self seed quite generously. In May the Cow Parsley or Queen Annes Lace fills the orchard and other areas and changes parts of the garden into a magical place for a few weeks. The Gloire de Dijon rose is early flowering. This rose is now 140 years old as seen in a photograph taken in about 1870 but when the front of the house was underpinned in 2000 it had to be removed so was stored in a large sack and was then planted 6 weeks later and to the astonishment of all, survived. 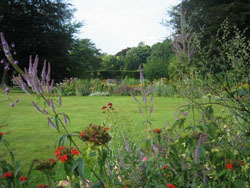 In late June/early July the garden is at its height. 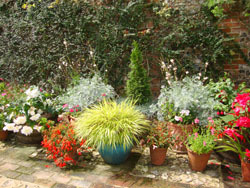 The herbaceous beds are a blaze of colour, there is a good display of dieramas (Angels fishing rods), pots of flowers in the courtyard and of interest is, the pergola bisecting the 23 small beds which have a variety of vegetables (asparagus mostly) and plants especially the opium poppies all add to the ambiance. Many different types of salvias start to bloom, michaelmas daisies, a lovely flowering tree, the koelreuteria, and later on the sedums, michealmas daisies and the blue of pevorskia livens up the autumn. Now the grasses have started to flower especially those in the meadow providing an allee which is an extension of the rill. Once again the herbaceous borders come into their own. The garden winds down in October and November although the pink nerines add a cheerful note of colour but it is still enjoyable to walk round as there is still a lot to appreciate if the frosts are late.